In August 2014 I became poet-in-residence at Greenwich Rail Station. 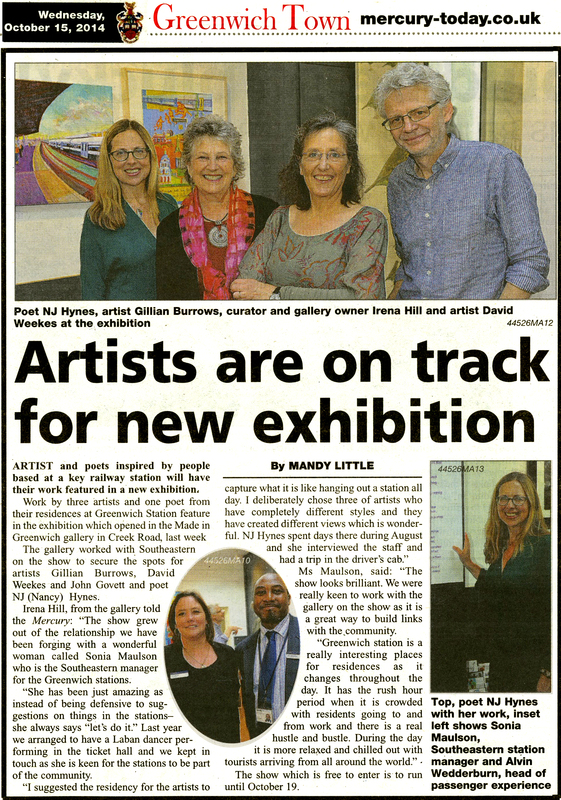 Three painters were also artists-in-residence, in an opportunity organised by Made in Greenwich Gallery in collaboration with Southeastern, with many thanks to Irena Hill and Sonia Caulson. The resulting exhibition, “On the Line: Art and Poetry @ Greenwich Station”, was shown at the Made in Greenwich Gallery in October 2014. The work chimed well, with different but complementary styles from painters Gillian Burrows, John Govett and David Weekes, and three poems — matching the tone of each artist. 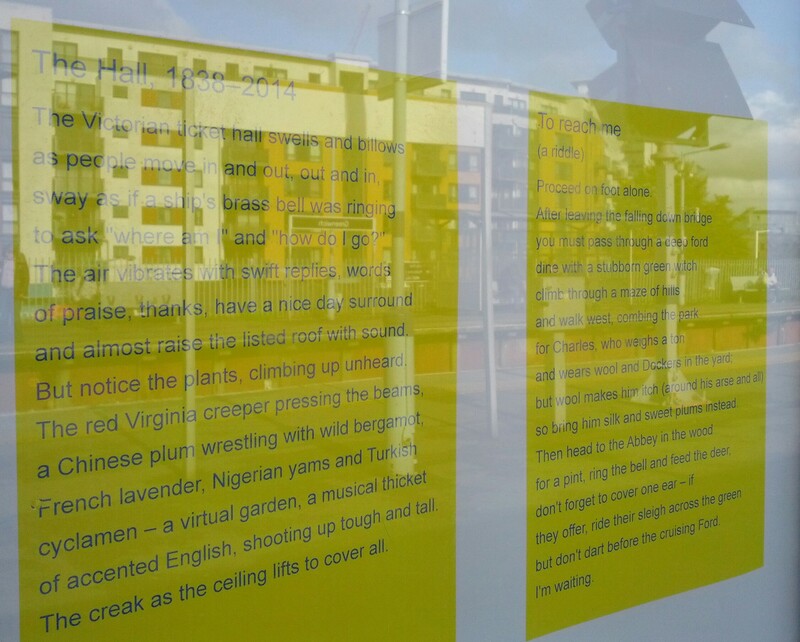 Posters were mounted at Greenwich Station, including my first poem poster (see below). This generosity of spirit, an acceptance of the noise and work created by cosmopolitanism, as well as its excitement, is the mood I tried to capture in my sonnet The Hall, 1838 – 2014. Other poems reflect stories told to me or details I discovered following staff tips, as well as my own fascination with sounds. For their warm welcome, good humour and many cups of coffee, I will always be grateful. 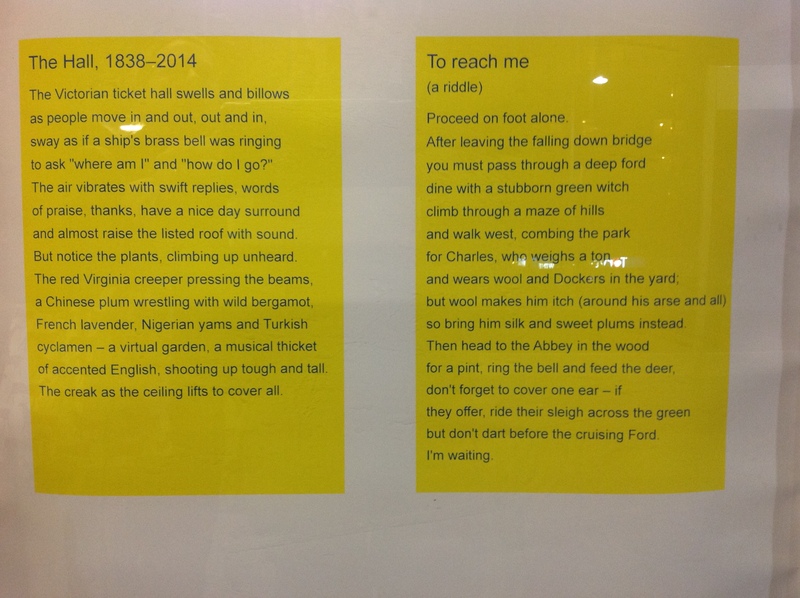 A highlight of the residency was Greenwich Station Revisited, an exhibition of my poem posters at the Made in Greenwich Gallery in September 2015. It was wonderful to see the results of my year-long creative collaboration with designer Paul Kley gathered together in one room, along with rail-related work by painters David Weekes, John Govat and Gillian Boroughs. The gallery hosted a reading, “The sting of speed and the solace of motion”, featuring Live Canon doing classic railway poems from Britain and North America, while I read poems from my residency. The mostly local audience was responsive, enthusiastic, and happily joined in to read my multi-voice collage poem “24 Hours”, which was based on over heard conversations and station announcements — truly a crowd piece. It was one of the best readings of the year. In addition, Southeastern made a video based on one of my sonnets, recorded at Greenwich Station. Southeastern wanted a staff member to read part of the poem. Dom was chosen and he became the real star of the film, cold reading the sonnet with a straight face and beautiful diction while his colleagues (well out of view of the camera and crew) tried to make him laugh. To view the video, go to the top of this page. 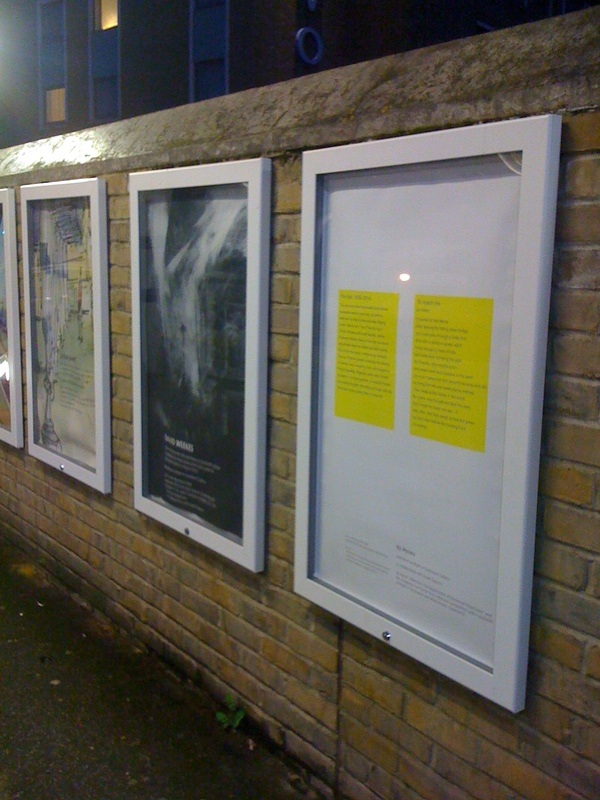 The first poetry poster went up at Greenwich station in October 2014, as part of “On the Line: Art and Poetry @ Greenwich Station”, a residency and exhibition organised by Made in Greenwich Gallery in collaboration with Southeastern. (See Greenwich Rail Station Residency page). It was designed by Paul Kley.